Eton Wick History: GEORGE F. PERCY - ROYAL WARWICKSHIRE REGT. 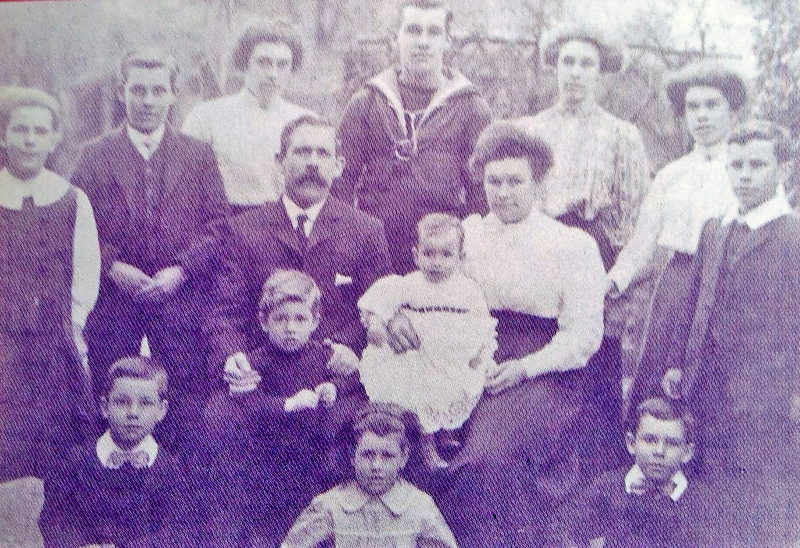 The Percy Family - George 2nd from left standing. George was a village lad and the second son in a family of six sons and six daughters. He was born on October 21st 1898, and attended the Eton Wick Infant School until he was 6½ years old; he then went to Eton Porny School, starting there on May 1st 1905. The family home was at No. 1, Castle View Villas in Sheepcote Road, not to be confused with Castle View Terrace in Boveney's, Victoria Road. Castle View Villas was a terraced row of eight houses on the west side of Sheepcote Road and having an uninterrupted view, over allotments and fields, of Windsor Castle, approximately 2½ miles away. All of this area was redeveloped after the Second World War. George was very young to leave the village infants school, and showed something of the same haste to leave the Porny School. It was in fact midterm, and three days before his 14th birthday, when he left school and gave as his reason for leaving "To Be A Houseboy". Presumably this was work in an Eton College boys' house. We do not know if it was a "live in" occupation, but with at least seven younger brothers and sisters at home it would have had advantages if he had been accommodated at his place of work. His older brother Alfred was in the pre-war Royal Navy. Certainly he was listed as serving on the Royal New Zealand Navy ship Philomel by September 1914, and by the time the war ended four years later he was a Petty Officer, Gunnery Instructor. In 1914 George was barely 16 years old, and at this time the Percy family were living at "Bangor Place" in Boveney Newtown. No date has been found when George enlisted in Slough, but in view of his age it was probably not before 1916. By this time the 1st Warwickshires had seen plenty of fighting, suffered many casualties and frequently had drafts of young replacements. In 1915 they had been used to seal a breach in the defence caused by an enemy gas attack. Well over half the Battalion became casualties. By 1916, when George may have joined the Battalion, they were fiercely involved in the opening assaults of the Battle of the Somme on July 1st. The 4th Division suffered a total of 4,692 casualties. The Battalion was in and out of the front line until July 24th when they moved to the Ypres sector. In September 1916 they were again back on the Somme, taking up positions east of Lesboeufs, before moving on to Guillemont and Bernafay Wood. The Somme offensive died down in November. In 1917 the Battalion, as a unit of the 4th Division, were actively involved in the Battle of Third Ypres, culminating at Passchendaele and all the appalling conditions associated with it. The following year brought ever increasing numbers of American troops onto the continent. Conscious of the effect these fresh troops would have, the Germans launched a massive assault along the allied line on March 21st 1918. Their attack was preceded by a shattering bombardment by over 6,000 guns. Both sides suffered heavy casualties and the allied line was forced to fall back alarmingly. As enemy pressure was renewed, still more ground had to be vacated. n April a determined thrust was made in the Lys River region, and it was here that the 1st Warwickshires were defending the line. General Plumer decided to shorten the line by straightening it during the night of 15/16th April. This meant giving up all the ground so bitterly won during the Passchendaele fighting of only a few months earlier. It was here, at La Bassee, on April 15th that George Percy was killed. His body was not identified, and having no known grave he is commemorated on the Ploegsteert Memorial to the missing, on Panels 2 and 3. The memorial is on the same site as the Berkshire Cemetery Extension, 9 miles south of Ypres and 4½ miles north of Armentieres, in Belgium. The memorial records the names of 11,447 missing men who fell in the battles of Armentieres and Aubers Ridge 1914; Loos 1915; Fromelles 1916 Estaires, Hazebrouck and Outtersteene Ridge 1918. Percy - George F. 1st Warwickshire Regiment, the second son of Mr & Mrs A Percy of Bangor Place, Boveney, Eton Wick. Reported as wounded and missing on April 15th 1918 now officially confirmed as killed on April 15th 1918 "Sadly missed by family and friends". George was one of Eton Wick's youngest fatality at 19½years old. John Carfrae Clark was also 19 years, but his exact age has not been established. George is commemorated on the Eton Wick Memorial and on the Eton Church Memorial Gates. The village family grave also bears his name. Eighty two years later there was still a Mrs Percy living in Bangor Place. She was the widow of a younger brother to George, and her own son, David, together with his family, lives in Victoria Road, Eton Wick. George Percy: The Commonwealth War Graves Commission page. George Percy: The For King & Country page.